A truly extraordinary instrument is the result of the meticulous selection of the finest tonewoods and careful construction, along with a clear vision of the end result. Through working closely with clients and by understanding their requirements, I craft a unique instrument tailored to their tastes. I build with a large variety of timbers from all over the world and closer to home here in Scotland. Over the years I've been able to stock pile an excellent collection. My rationale is: 'When you see a piece of wood that ticks all the boxes, buy it.' I've had wood in the racks that I bought over 10 years ago and might not use for another 10, not until the right build comes up. All wood gives something different to an instrument's tone, balance, power, feel, and look. Let's look at the different woods I use, and their influence on these factors. Best Tonewood? A question I'm often asked. I would say, they're all the best if it's right for you! These are the hardwoods I use for the back & sides of the instrument and some notes about the characters they can bring to the table. A true Rosewood from Mexico with beautiful reds and purples through its striking grain. Adds power and complexity to that rich Rosewood character. More dense than Cocobolo and Indian Rosewood, Madagascan Rosewood gives all the classic Rosewood sound but with a shimmer and focus to the high frequencies and overtones. Deep burgundy in colour with amazing black inky lines we call Spider webbing. Used for its wonderful mix of deep rich tone and wonderful overtones, Indian Rosewood is one of the most common woods used in guitar making. Colours vary from Chocolate brown to purple. Almost holographic in its dark brown colour, African Blackwood is a true Rosewood. However, it differs from other Rosewoods in its tone. Very focused with few overtones, it makes for very direct sounding guitars full of power. Absolutely beautiful in looks and equally amazing in tone! Tasmanian Blackwood is a new material for me however it has not disappointed. Open soundings and incredibly rich, more so than the other woods in this section. It has a bite to the sound and then you turn over the guitar and as I do....Stare. This amazing wood can vary from greens and dark reds to chocolate browns and yellows. Closely related to the Ebony family but not deemed a true Ebony, Malaysian Blackwood brings a focus to an instrument and also a warmth. Acers have been used in classical instrument making for centuries. Beautiful in figure and tone. I describe it as a transparent tonewood as it lets the soundboard do the talking in an instrument. Very clean, bright and lively with a woody punch; that's a better way to characterize it. Hailing from Mexico and Central America, Ziricote simply has the most unbelievable grain. I find it incredible that this grows out of the ground. Tonally, it is bright but warm with a dry woody voice. Swietenia macrophylla or Honduras Mahogany is the most amazing wood! I have been collecting reclaimed Mahogany for over 10 years and I love it for its versatility and tonal qualities. In back and sides, it gives a dry punchy sound, not over complicated just powerful and wonderful. There is more on mahogany in the Neck section. An immensely dense wood, Wenge comes from Central Africa. Dark brown with very pronounced straight lighter brown grain lines. Its tone is dry and with an amazing ring when tapped. I like it for necks when a more focused tone is required. However, when I use it for back and sides it creates an instrument which is warm and punchy. The Soundboard is the engine of any instrument. 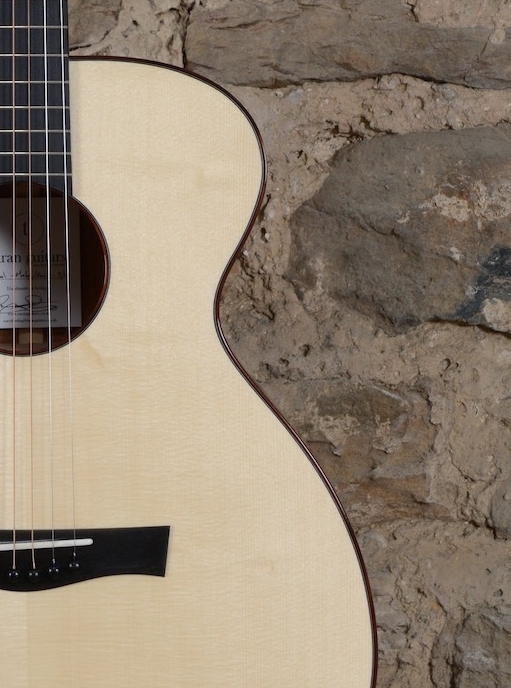 Amplifying the strings' energy into air waves that emerge from the sound hole. The soundboard's job is so incredibly complicated! It has to withstand the string pull which can be upwards of 80kg (more than I weigh), but also vibrate as freely as possible to create the spectrum of sound we hear from a guitar. The more finely tuned this balancing act is, the better any instrument will sound. Depth and character would be the first words that I would use to describe Euro spruce. Of course, there isn't just one type. Italian Spruce has more power I find than German, which is richer. Swiss is the classic to my ears - very balanced and a richness and power that is controllable. All are wonderful and easy to choose from when the desired outcome of the instrument is known. 'Adi' ... perhaps the bully of the top woods? If head room and power are what you need, look no further. Since 1915 'Adi' has been in short supply. However, since the end of the 2nd World War forests have had time to grow. So, Adirondack Spruce has the one of the greatest strength to weight ratios of any soft wood! Perfect for making light and manoeuvrable fighter planes like the Mustang. Thankfully now we can put it to better use! Western Red Cedar is a wonderful soundboard wood when looking for a brighter/shimmery sound. Softer than the spruces in physical terms and as well tonally. It works brilliantly with earthy back and sides like Walnut to create an instrument that sings or equally well with Cocobolo to give even more warmth. As with every part of a guitar the neck design and material selection is incredibly important. It has to be strong enough to survive a life of high tension in a very precarious position with the headstock generally the farthest from the floor if the guitar falls over! When I build a neck I'm always thinking about these demands. I use a scarf joint on the headstock to minimise short grain along the angle change and I also like to put a graft on the back to compound this joint's strength. When looking at the neck joint, there are a number of different joints I employ for different situations. My main joint is a dovetail that is removable if required; this gives an immensely strong and stable joint that is brilliant at transferring energy into the soundboard. I also use a bolt on neck and Portuguese neck joint for smaller instruments like the tenor and mandolin. All of these are decisions and design elements that aid the tone production of an instrument. However, it is the choice of material that is critical to achieving the exact desired tonal outcome of any instrument. Stiffness: The stiffer the better as the more it channels the strings' energy into the soundboard. These elements are combined in the following materials and create different sounding instruments. A truly wonderfully diverse neck wood. Stiff but with a wide range of masses to select from. Brilliant for pulling out all the characters of dense woods like Rosewoods and Blackwoods. When combined with woods like Walnut and Sycamore it opens the tonal range. A heavier neck with Sycamore will increase the punch while a lighter neck with Walnut will give more air to its naturally earthy sound. Incredibly dense and when used with already focused woods like Blackwoods, it makes for a instrument with massive presence and power. Still very stiff but very light, making it brilliant to open the range of smaller instruments. As well as these brilliant woods for the neck material, I also use Carbon Fibre and a two-way truss rod in all necks. The Carbon adds stiffness to anything and thus only increases the energy transfer. The two-way truss rod enables perfect playability up the neck at all times. My chosen finish for the exterior of instruments is an AC 2 Melamine Lacquer. Primarily, I use it because it can be applied thinly. However, there are other benefits as well. This lacquer was first designed to be used on Bar tops! Sounds industrial? It is! It is also resistant to alcohol and other chemicals and light acids making it perfect for working instruments. All of that said, it is the thickness that I can achieve while making a really durable finish. At around 0.08mm (half a beard hair) this finish allows the guitar to move freely and sound unhindered. It also doesn't crack like Nitro finishes and is repairable. I offer a French polished finish on the inside and outside of my instruments. 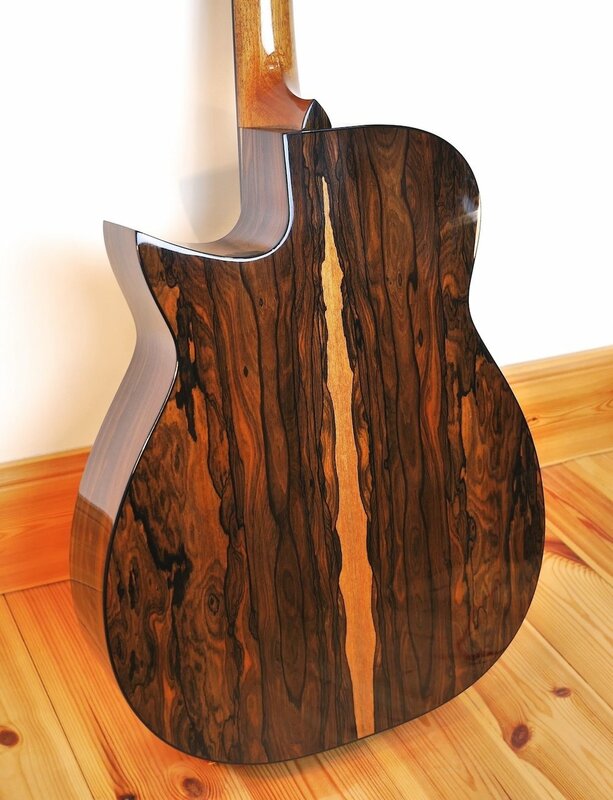 While French polish adds a beautiful depth to the inside of a guitar, it also slows moisture movement in the guitar. Worth thinking about if you live in a dry environment or do a lot of touring. When used on the outside of an instrument it is super and I mean super thin. It is said to enhance the tone of an instrument, however for working instruments sadly it just isn't durable enough. Hand rubbed sunburst Tirga Beag. Such depth in the grain! This is a technique I learnt a few years ago and one I love for the variety of looks you can achieve. It's a very difficult and painstaking finish that requires nerve and patience. But the depth of finish and colour achieved is simply beautiful. I tend to finish with Melamine Lacquer over the top of a hand rubbed finish because if the wood gets damaged it is very difficult to repair seamlessly. For an instrument that is your very own and not a work instrument, this is definitely a detail to look at if you love the sunburst but want something with more depth than a sprayed burst! Rocklite is the brain child of Stephen Keys, a tonewood supplier from Kent. I was lucky enough to be involved in the development and testing of this exciting new material. What is it? - A sustainable and eco friendly substitute for Ebony. Is it real wood? - Yes, this is not vulcanised paper but real wood. With the new restrictions on Rosewoods I am in the process of trialling new woods to add to the list of materials I use. These include native woods like Oak and Walnut but some other more unusual woods... Watch this space!